Favorite Proverb: "Neither doctors nor the Kusatsu Hot Springs can cure the illness called love." and every positive proverb about love. A young underground doctor who lives with Celty and is also her lover. He mostly remains indoors and wears his white doctor's coat even when he is not at work. He went to the same primary school as Shizuo and Izaya and finds them interesting, enjoying their fights ... up to a point. 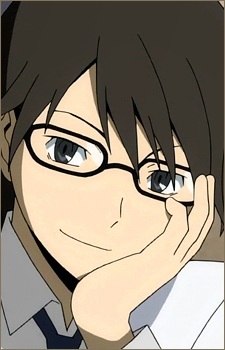 His father was also a doctor, and as a child Shinra participated in surgery alongside him, the most notable being an autopsy on Celty when they first met. As a doctor he is rather interested in what he considers to be interesting phenomena, such as the unlimited strength Shizuo shows in times of anger, and Celty's healing, headlessness and bodily functions. Shinra seems to have the "capacity" to tell what Celty is feeling, much to her surprise since she doesn't have a head to show her emotions.